Is your child begging you for a Minecraft Party? Get inspiration from these fun and creative Minecraft ideas and your child’s party will be a hit! Minecraft was initially released on May 17, 2009. Since then, it became one of the most popular online games in the world. It was created by self-taught Swedish programmer, Marcus “Notch” Persson. It was then later acquired by Microsoft which led to Persson being listed as one of the world’s billionaires! Minecraft was later released on Mac, Xbox 360, Microsoft Windows, PlayStation 3, and some mobile phones. Minecraft is a first-person game where the characters basically dig holes in a virtual landscape to collect blocks. Sounds boring? Well, not until you start creating masterpieces from the blocks you collect. From simple huts to the elaborate buildings, anything is possible as long as you have the right tools and of course, as long as you collect enough blocks. It’s a game that requires creativity. You can do whatever you like – build and create a fantasy world or seek out adventures and fight some bad guys. Minecraft Party Idea #1: The great thing about having a Minecraft party is that you won’t run out of ideas (and energy) when coming up with some party food. Simplicity is the key. So why not serve up some snacks at your party like this Minecraft Pretzel Idea. There are lots of Minecraft printables like the one above available online. 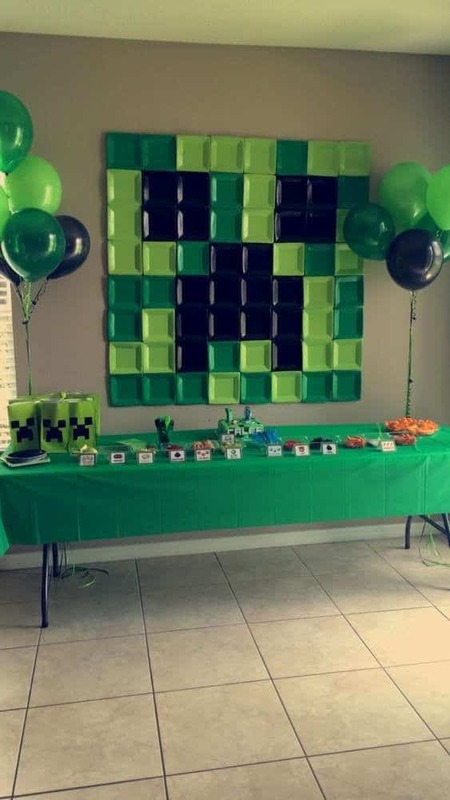 Minecraft Party Idea #2: For great Minecraft birthday party ideas, there’s really no need to spend a lot. To have an awesome party, all you need is creativity! So it’s time to put your creative skills to work when making Minecraft desserts. 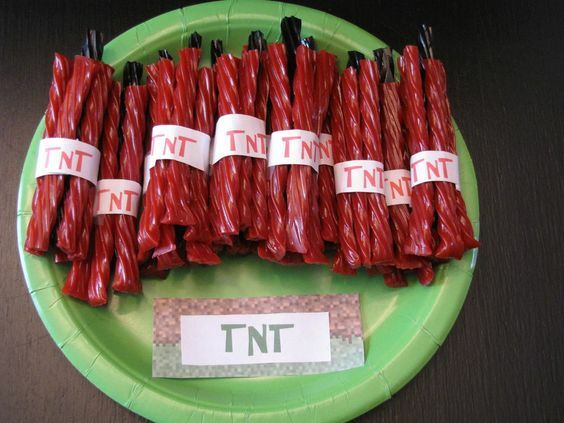 All you need is some licorice to pull off this Minecraft Party TNT Idea! Minecraft Party Idea #3: Now here’s another great idea for your Minecraft party. Get these Free Printable Minecraft Drink Labels for your party drinks! Turn your ordinary bottled juice or water into magical healing potions that your guests would love. Just print these, cut them and stick em’ on your drinks. 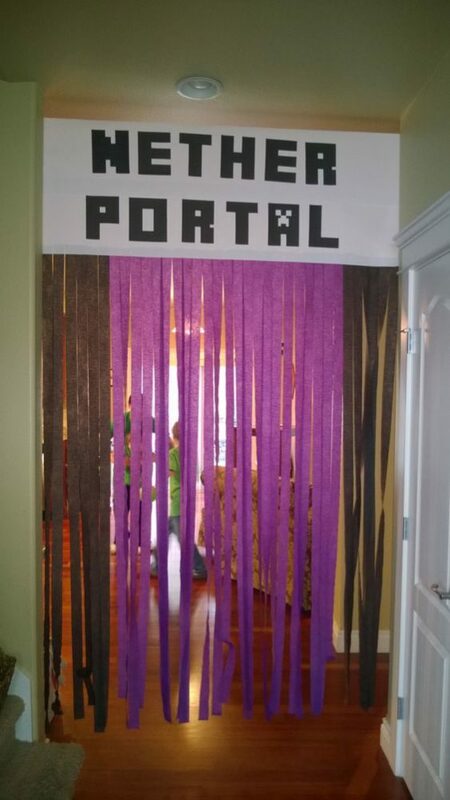 Minecraft Party Idea #4: Oh we’re loving this one! 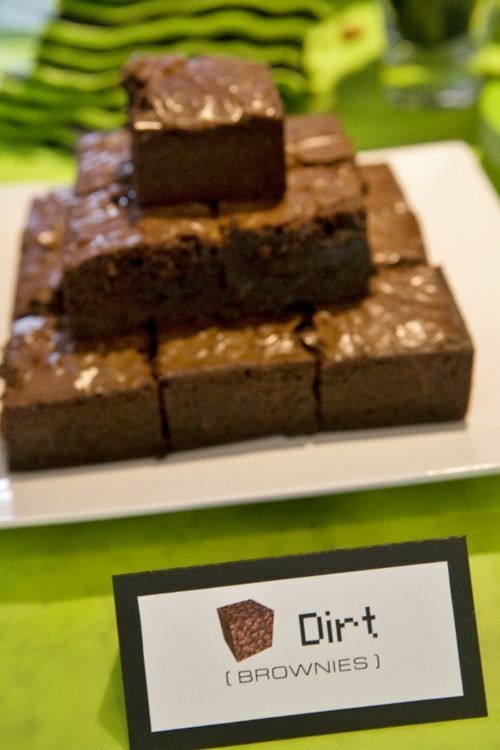 Brownies make the perfect party food when your kid is wanting to have a Minecraft party! These delicious Minecraft Dirt Brownies are perfect to serve on your dessert table. All you have to do is whip up a batch, bake and serve. Quick and easy, right? Minecraft Party Idea #5: There’s nothing better than some Free Minecraft Party Printables for your Minecraft party! There are water bottle labels, treat toppers, tented food carts, birthday invitations, and a whole lot more. We’re loving the welcome sign that goes with it too. Grab these free printables for your party now! Minecraft Party Idea #6: How clever are these Minecraft Krispie Treats?! They’re simple, delicious and fun to make as well. 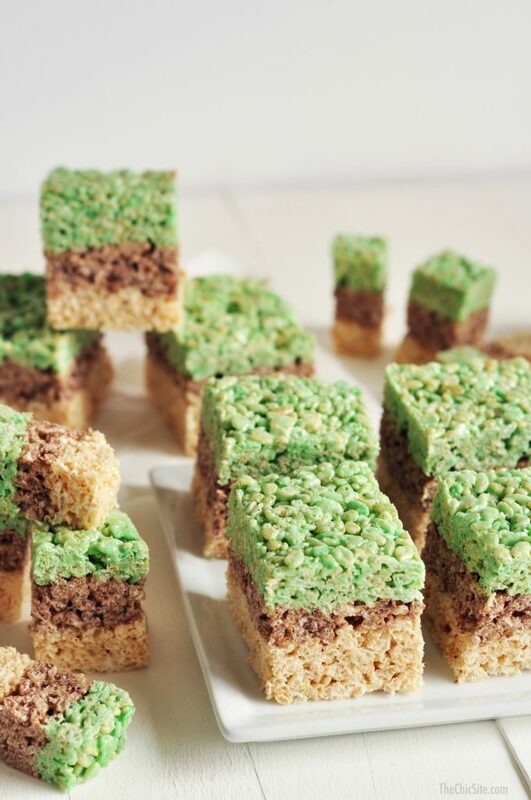 All you need are some rice krispies, butter, marshmallows, and some green food coloring and you’re ready to serve them at your Minecraft party! 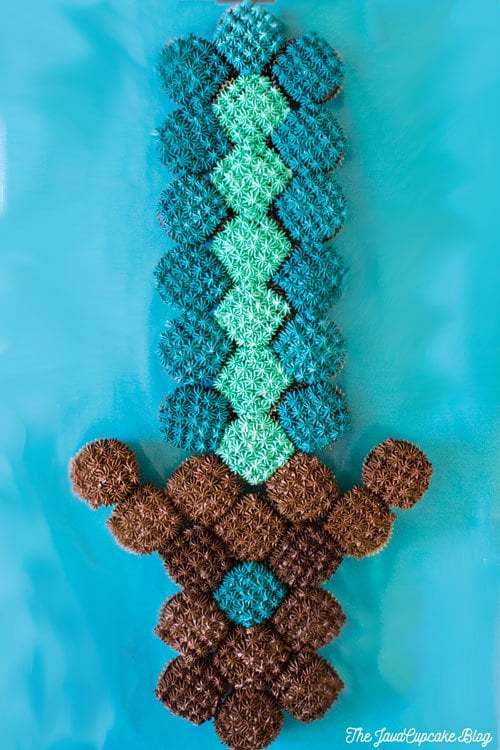 Minecraft Party Idea #7: What kid wouldn’t LOVE this Minecraft Sword Pull Apart Cupcake Cake? Minecraft cupcakes are the ideal dessert, well, aside from the cake of course. By just picking out the colors and re-arranging the cupcakes, you can easily incorporate them into your Minecraft party. 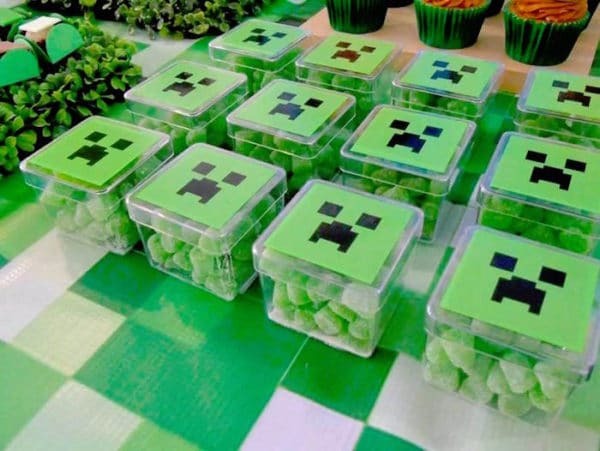 Minecraft Party Idea #8: Give each party guest these Minecraft Creeper Gumdrop Favors to take home. They will love it! Just put some green gumdrops into clear plastic containers, and then print and stick some creeper faces and you’re good to go. 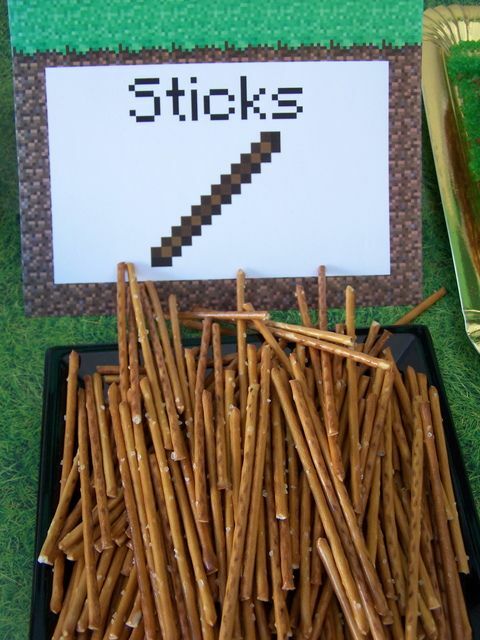 We can see this idea being popular at any Minecraft party! Minecraft Party Idea #9: Sometimes, the best Minecraft party ideas are not the most elaborate ones. 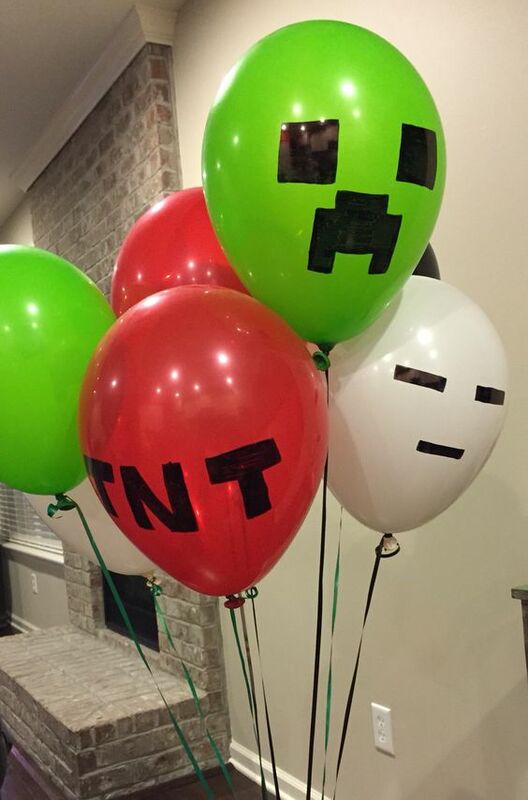 A little black marker or black tape is all you need to make these Minecraft Party Balloons! Minecraft Party Idea #10: A DIY Minecraft party is not hard as you think. 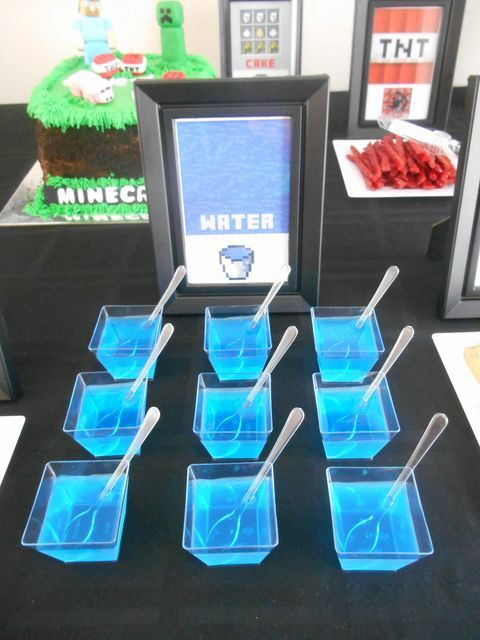 This Minecraft Blue Jello Water is quite easy to make. Kids are sure to come back for this yummy treat again and again. 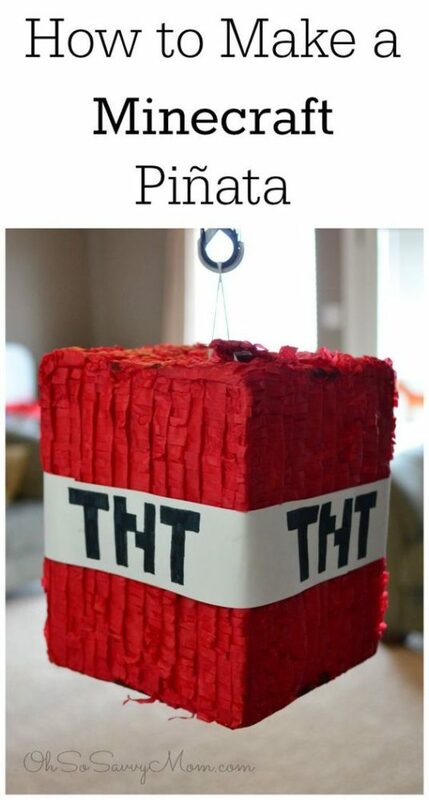 Minecraft Party Idea #11: What’s a Minecraft party without a piñata? 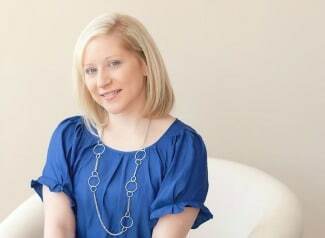 If you want to learn how, Oh So Savvy Mom can show you How to Make A Minecraft Party Piñata. 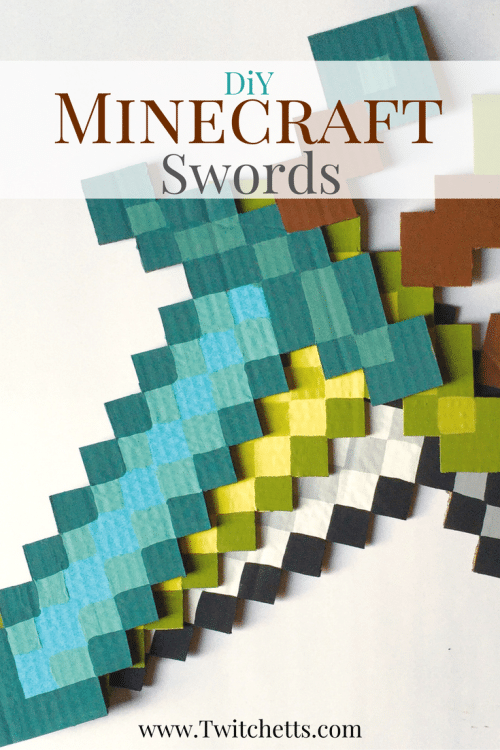 Minecraft Party Idea #12: These DIY Minecraft Swords are easy to make and the kids (and adult guests) are sure to have a blast playing with these at your Minecraft party. They make the perfect decorations/party favors as well. 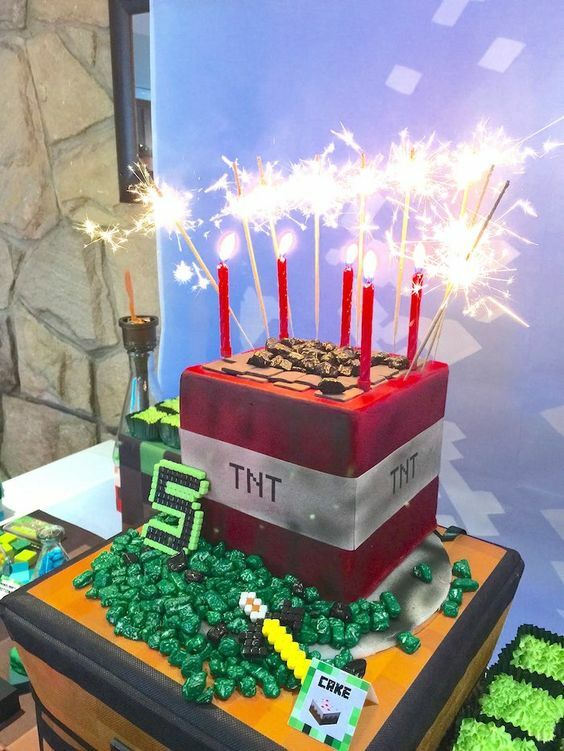 Minecraft Party Idea #13: Wow, now this Minecraft TNT Cake will blow anyone away! If you’re looking for a cake that will complement your Minecraft Party, this is absolutely it. 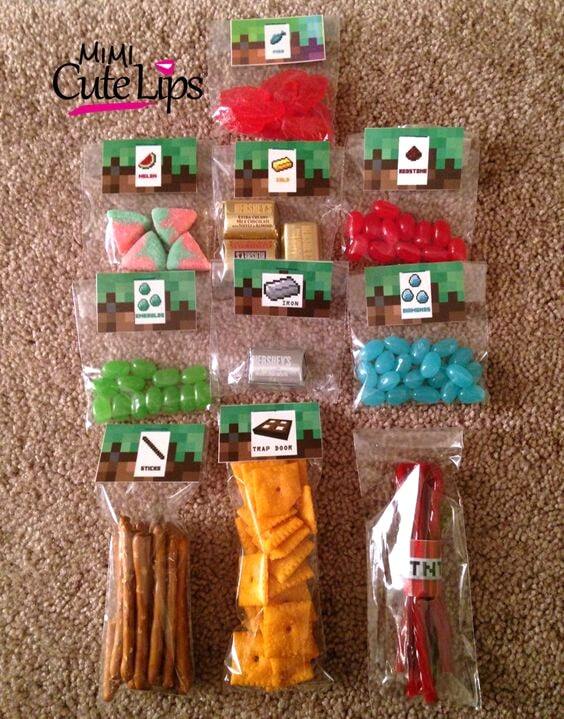 Minecraft Party Idea #14: Looking for some party favors ideas? Match up the goodies with the toppers on these Minecraft Favor Bags. 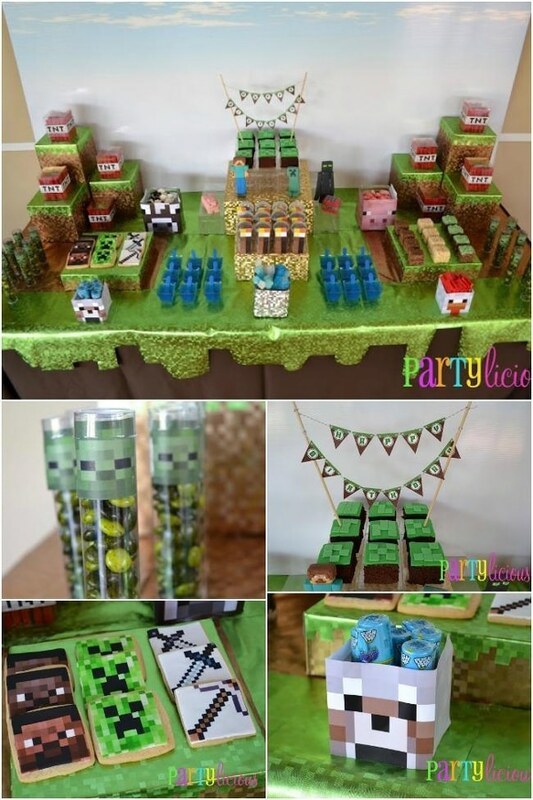 What a great idea for a Minecraft party! Minecraft Party Idea #15: This creeper face background is amazing and yet easy to do. Square plates are all you need to create this awesome Minecraft Paper Plate Dessert Table Backdrop for your Minecraft party! 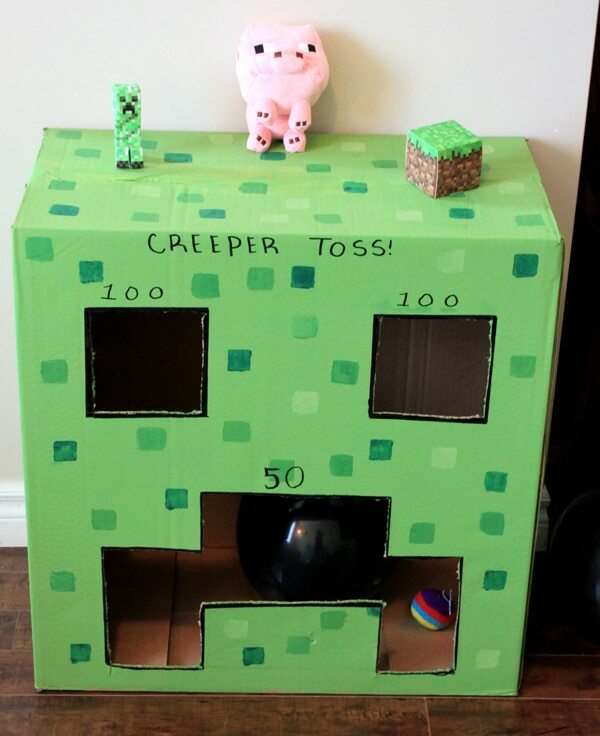 Minecraft Party Idea #16: The kids will have a blast playing the Minecraft Creeper Toss Game at your Minecraft party! All you need is a big box, some paint, or colored paper, and balls and then you’re all set! Minecraft Party Idea #17: Sometimes, the best party ideas come in simple packages. 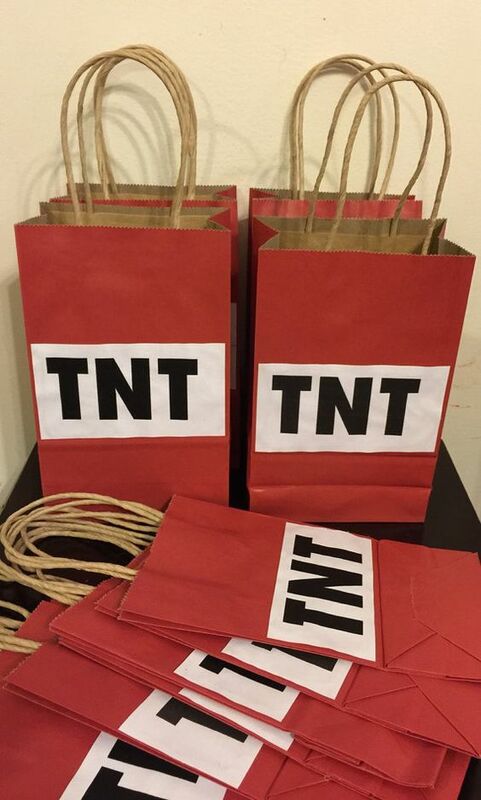 Fill these Minecraft TNT Favor Bags with candy for your party guests! They will think your Minecraft party is the coolest! Minecraft Party Idea #18: To complete your Minecraft theme, don’t forget the small details. Like how cool is this Minecraft Nether Portal Party Entrance?! This would love great at any Minecraft party! 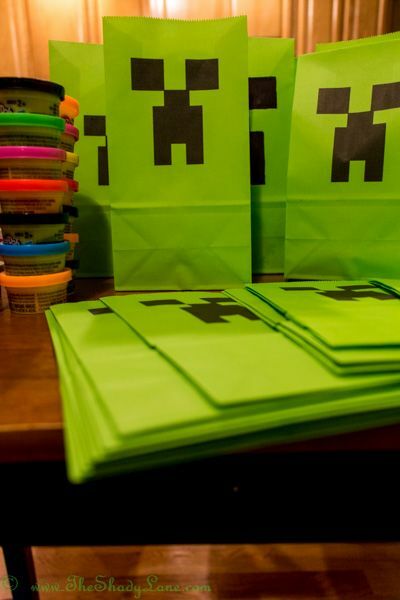 Minecraft Party Idea #19: These Free Printable Minecraft Creeper Favor Bags are perfect for any Minecraft birthday party! All you need are some green paper bags and black art paper to make the creeper faces. Minecraft Party Idea #20: Get some inspiration for your Minecraft party by checking out the many fun elements in this Minecraft Dessert Table! What’s your favorites from these 20 Kids Minecraft Party Ideas?! Let us know in the comments below! Looking for more party ideas? Don’t forget to follow us on Instagram @prettymyparty and Pinterest and join us in our private Facebook group. Love this list!! Thanks for sharing my Minecraft Creeper party bags! I can’t get the printables to work. I clicked on the link and download. It adds the new tab and then nothing comes up. Ideas?